Around 30 ramblers turned up for this first restricted numbers activity for the season on what turned out to be a surprisingly warm day for the time of year. 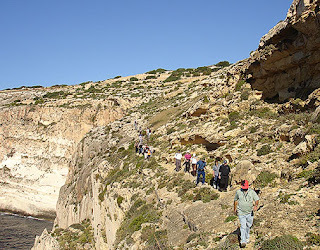 From near Gnien il-Gibjun in the Nigret neighbourhood of Zurrieq we winded our way downhill to access the point called Il-Munqar - characterised by a curious skyward-pointing beak-like rock outcrop. 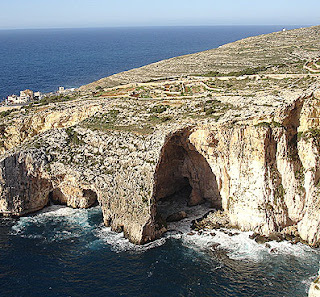 This point affords arguably the most spectacular vista over the famed Blue Grotto and the adjacent Wied Babu. A little backtracking was made here in order to get to the cliffside seaward path which we then followed all the way to Wied il-Bassasa. This cliffside path is characterised by sweeping sea vistas and a rock terrain rich in a varied carpet of coastal flora - at its best in spring rather than in autumn. From Wied il-Bassasa it was a steep uphill climb which tested energies and brought out the sweat on a day which saw temperatures rising to 23c. From here a succession of paths bypassing used and abandoned quarries brought us back to our start point. 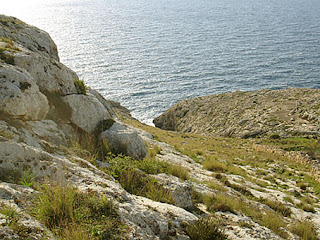 A particular curiosity of this scenic and peaceful area is that around half a century back it witnessed the worst airplane crash in Maltese history. On the 18th of February 1956 an Avro York airliner belonging to Scottish Airlines crashed here with the loss of 50 lives. There were no survivors. There was some debate among ramblers as to the exact crash site and whether any memorial is in place in the area. None could be traced however. A most enjoyable walk with fantastic scenary thrown in. Intense walk for sure, in a very nice area. Prosit.